These are a series of riddles. They are all connected. 1) There are 100 bricks on a plane. One falls off. How many are left? 2) What are the three steps to put an elephant in a fridge? 3) What are the four steps to put a giraffe in a fridge? 4) A lion was having a party and he invited all the animals. All of them came except one. Which one was it? 5) A lady crossed a crocodile infected river and survived. How? 6) She crossed back and died. How? 1) 99 2) Open the door, put the elephant in, close the door. 3) Open the door, take the elephant out, put the giraffe in, close the door. 4) The giraffe. It was in the fridge. 5) The crocodiles were at the party. 6) The brick from the plane hit her in the head. 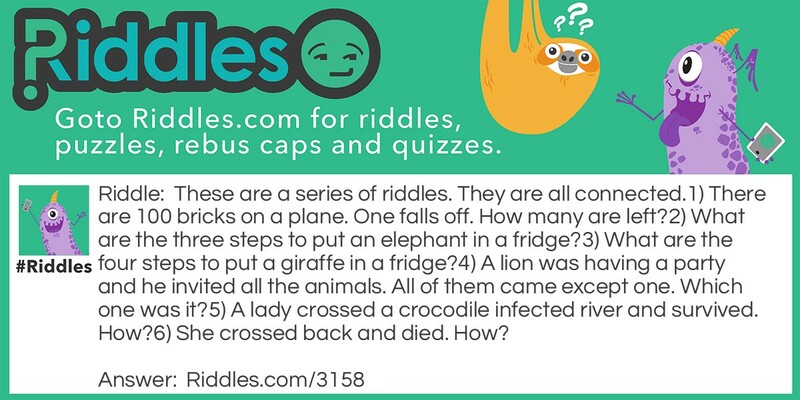 Series of Riddles... Riddle Meme with riddle and answer page link.